This weekend has been really busy but I’ve been craving roasted chicken. My craving didn’t leave me a lot of time to prepare a proper brine so I did a quick brine. 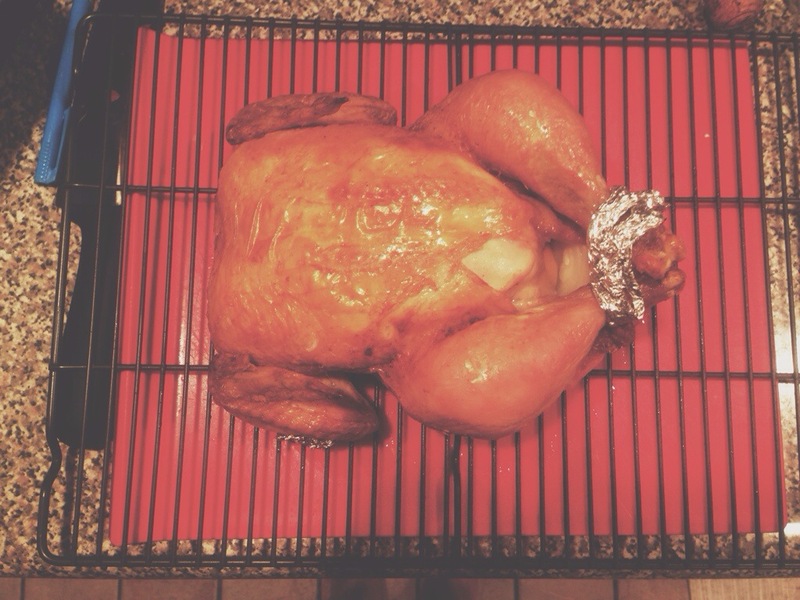 I was going to try to grill the chicken with a beer can but then just opted to roast it in the oven. To accompany the chicken, I made Cuban black beans and rice. Unfortunately, no pressure cooker and I didn’t have the foresight to rinse some dried black beans in preparation. So I used canned black beans and they actually worked pretty well. My only regret was not adding more cayenne pepper to make them spicier. Preferably in the pot you will be placing the chicken in, heat the salt, 2 tablespoons spice rub and water until dissolved. Take off the heat and add ice. Rub remaining spice rub all over chicken (inside cavity too). When ice has melted, place chicken in pot fully submerged and refrigerate for at least 3 hours. After quick brine, preheat oven to 385. Take chicken out of brining solution and pat dry with paper towels. Under skin, rub butter. Inside cavity place two halved onions and one half lemon. You can actually add whatever spices you want (fresh rosemary or thyme would be good) but I didn’t have any on me when the roast chicken urge struck. Tie chicken with kitchen twine (I didn’t have any so I used aluminum foil) and secure legs. Place on wire rack above span (which will catch all the juice that drips). 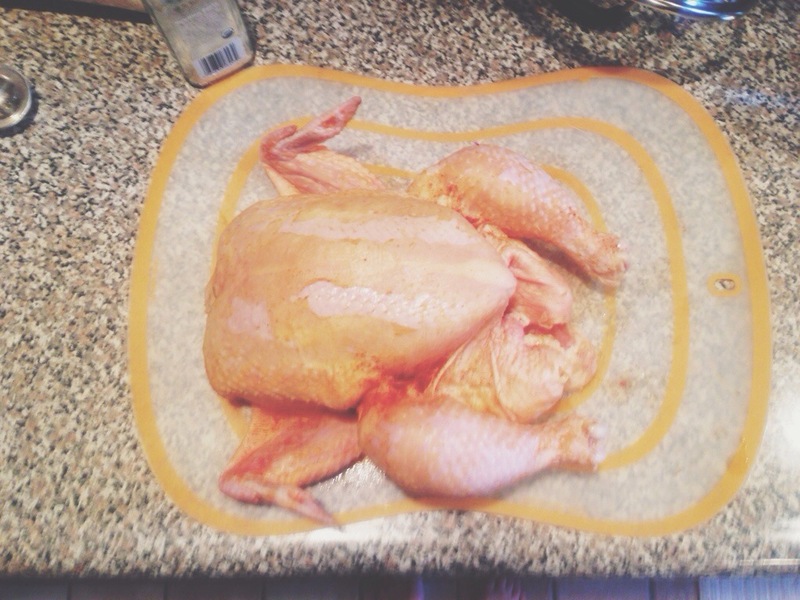 Cook for about an hour, until chicken meat registers 185. When ready, take out, remove everything from cavity. Loosely cover with foil. Let rest for 10 mins. Carve and you’re ready to serve! I spooned some of the dripping juice on the chicken right before I served. Cook bacon until crispy. Add onion and bell peppers and cook until translucent. Add garlic and cook until fragrant. Add rice and spices and mix well. Add water and beans. Cover and cook on low heat for about 40 mins until rice is cooked. It was obviously simple but so great. Everyone really liked it! Yay for leftovers tomorrow. 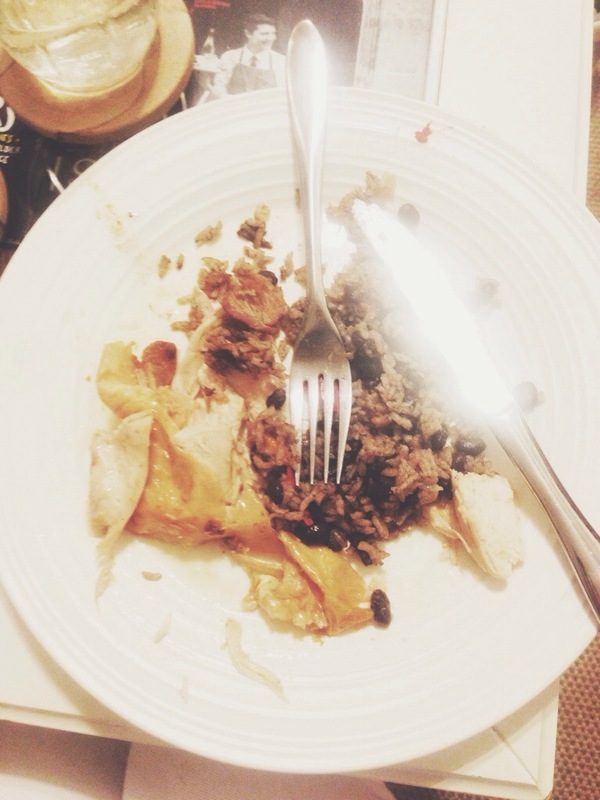 This entry was posted in weekend and tagged blacks beans, brine, chicken, good for groups, rice. Bookmark the permalink.